We hear more and more about the Pause. This pause refers to a hiatus in lower atmospheric warming for a human generation since 1997. This “pause” by its very name implies that warming will resume sometime soon. It did not turn out that way at all. It was the end of a 60-70 year cycle that we do not understand. Will it still be a “pause” if temperatures decline for another twenty years? 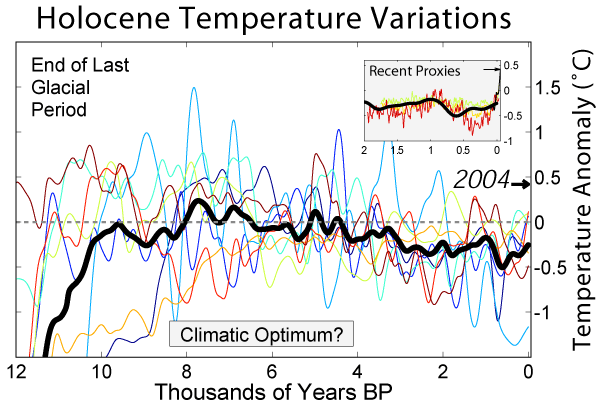 This is the average of a bevy of proxies since the last glaciation. The lunch money stuff between WWII and the present doesn’t even register here. One can see there have been several “pauses” along the way, and several episodes of warming. This one did not turn out so well either, and if you could only know, it would be well to avoid rash predictions on the cusp of phase changes. What the “pause” certainly tells us is that natural cycles at least equal human changes to the climate. When it is getting hot, a pause is always refreshing. This entry was posted in Climate, Global Warming, Paleoclimate, the "Pause" and tagged Climatic Optima, Pause. Bookmark the permalink.